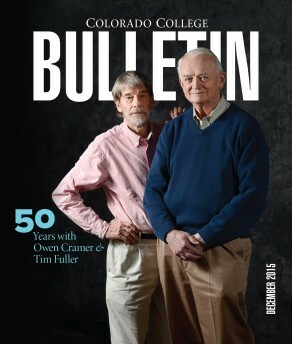 The Colorado College Bulletin, a publication of the Office of Communications at Colorado College, is distributed to alumni, as well as parents and friends. It is published three times a year and seeks to portray the people, events, experiences, and topics that best reflect a CC education. The Bulletin is an important link between readers and the college, and comments, feedback, information, etc. is welcomed. Please help us build a better Bulletin by participating at sites.coloradocollege.edu/bulletin or via email to bulletin@coloradocollege.edu.